Where is this mystical land? (NASA/ESA/HST). Sometimes, words are not enough to describe views of the universe when captured through the lens of the Hubble Space Telescope. This is one of those moments. 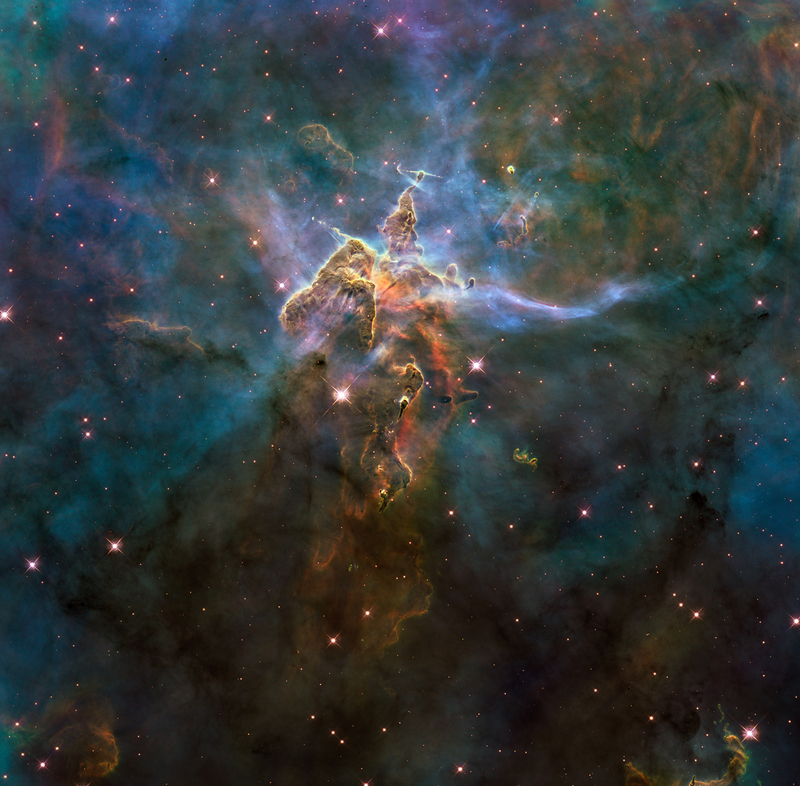 Kicking off its 20th anniversary (yes, that super-sized telescope has been in space that long — I would say that I remember it being launched, but I don’t, because I was nine, playing with my Star Wars toys), Hubble has published some astonishing images of deep inside the Carina Nebula, some 7,500 light-years from Earth. And, quite frankly, I’m floored. BIG PIC: Have a look deep inside the Carina Nebula with some of my Discovery News coverage of the event. The pillar of gas and dust looks like a gnarled tree branch, dotted with sparkling lights. 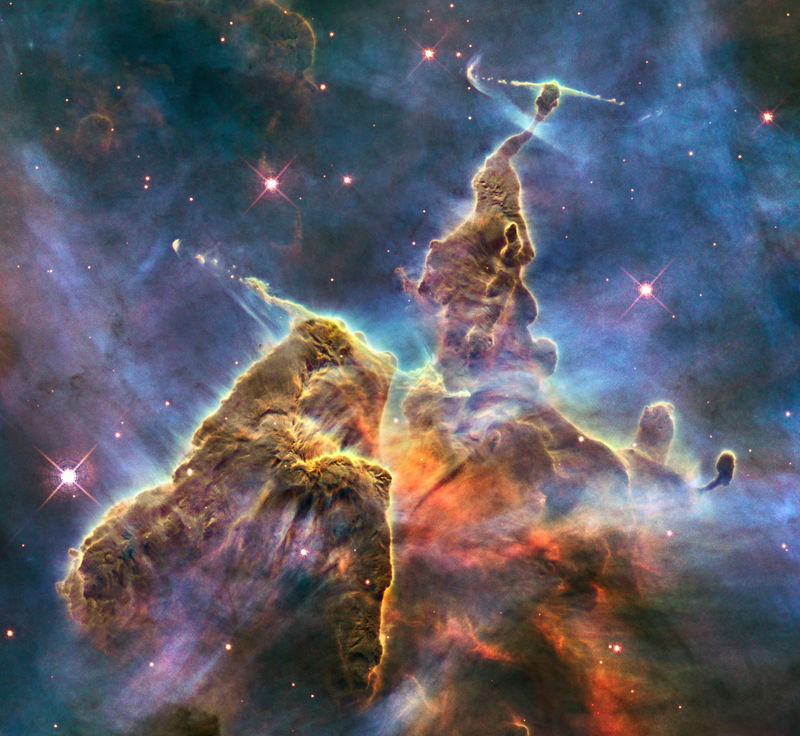 The Hubble press release even describes the structure as a “Mystic Mountain,” and it’s not hard to see why. In this age of computer generated everything, this release of images show that the cosmos contains things that defy our tiny imaginations. We are looking at a star-forming region, deep inside the nebula, where stars are being born inside the bulbous towers of gas and dust, but on the outside, young stars are battering the tower with intense stellar winds and powerful radiation. The pillar is being eroded away. However, this exterior pressure is seeding the birth of new stars inside the nebulous material. The mindblowing clarity of this Hubble observation even brings out the fine detail in the jets of ionized gas as it is blasted from the point of the tallest finger of material. This is being generated by a young star, gorging itself on gas, forming a superheated accretion disk, blasting the energized gas out from the stellar nursery. As Hubble’s 20th anniversary celebrations continue, I think we can expect a lot more where this came from. So brace yourself, this gem of a space telescope may be getting old, but it still has a shedload of cosmos to show us.